Gottfried Wilhelm von Leibniz (1646-1716) was a Christian, or, perhaps more accurately, Neo-Gnostic German polymath famous for his contributions to mathematics and philosophy. He was a major intellectual force in the 17th and 18th centuries, and is known as the last "universal genius". Leibniz is also referred to as pantheist. In mathematics his greatest achievement was his independent discovery of differential and integral calculus, also simultaneously invented by Isaac Newton. Modern calculus follows the notations and conventions of Leibniz, not Newton. An ugly dispute developed between Newton and Leibniz over who discovered calculus first. Most British historians gave the credit to Newton, while the continental historians credited Leibniz. Both deserve credit: while Newton was the superior mathematician, Leibniz provided the more intuitive notation. In physics, Leibniz proposed the use of "dynamics" or kinetic energy to explain motion, rather than "mechanics" that is based on Cartesian coordinates. Leibniz held the view that light always travelled the path of least resistance. In philosophy, Leibniz disagreed with Descartes' "I think therefore I am" and he instead thought that neither form alone (the mind) or matter alone (the body) could explain the existence of an individual. Instead, Leibniz created a philosophy known as "monadology", which holds that souls are all there are in the universe. Even a table, according to Leibniz, is nothing other than a collection of "windowless monads" which cannot interact. However, already in the third and fourth centuries A.D., the Monad(s) were part of Mediterian gnostic cultures that Christian scholars harshly opposed until the battle against gnosticism was won by 325, the date of Council of Nicea. From this perspective, Leibniz was doing nothing more than reformulating an old heretical etnotheology widespread during the era of Arianism. Between 18–21 November 1676, Leibniz met personally with Benedict de Spinoza discussing various philosophical topics, including the ontological argument for the existence of God. Leibniz was a Lutheran who dreamed of reuniting the Lutheran faith with the Roman Catholic Church, and also of reconciling modern thinkers like Hobbes and Descartes with the Scholastics, or even with the earlier Greek philosopher Aristotle. Such striving to reconcile various schools of thought is known as syncretism and was native to gnostic heresy. In 1725, Louis Bourget, professor of philosophy and mathematics at the University of Neufchatel, was urged by one of his correspondents to abandon incomprehensible metaphysical ideas including Leibnizian monads. Walter Benjamin, one of the leading exponents of the Frankfurt School, a Marxist splinter group trying to advance so called Cultural Marxism, has been called the heir of Leibniz. Broad, C. D. Leibniz: An Introduction. Cambridge University Press, 1975. Brown, Stuart. Leibniz. University of Minnesota Press, 1984. Jolley, Nicholas, ed. The Cambridge Companion to Leibniz. Cambridge University Press. 1995. Jolley, Nicholas. 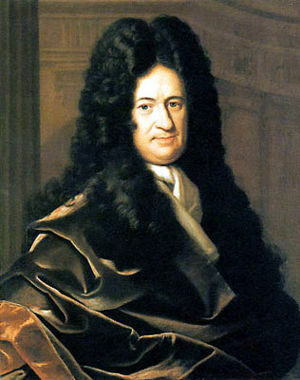 Leibniz. Routledge, 2005. ↑ Rhoda Rappaport (1997). When Geologists Where Historians, 1665-1750. Cornell University Press, 133. ISBN 978-0801-433863. This page was last modified on 26 September 2018, at 12:03. This page has been accessed 19,610 times.